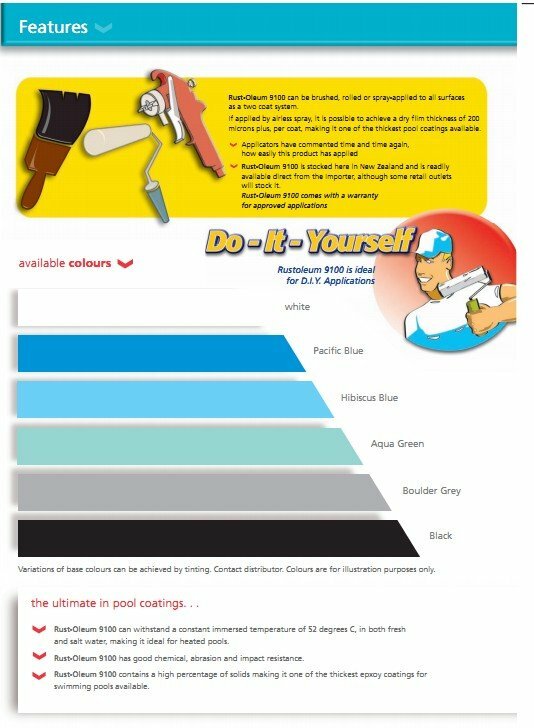 We have a range of approved applicators nationally that can prepare and paint your pool using our proven paint system or if you are doing the work yourself then the below guide will be useful to you. Our swimming pool paints and coatings are ideal for fibreglass pools, concrete pools and textured plaster pools such as marble plaster. 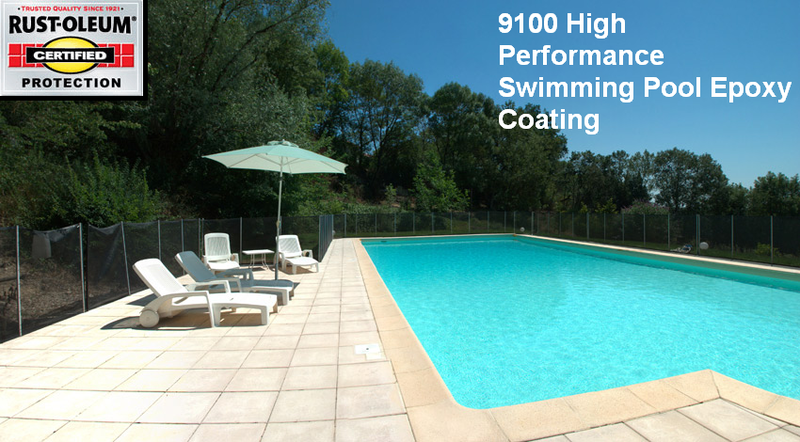 RUST-OLEUM 9100 SWIMMING POOL HIGH BUILD EPOXY. Here are the following steps to take into consideration. These instructions relate to our RUST-OLEUM 9100 SWIMMING POOL HIGH BUILD EPOXY product. APPLICATION RECOMMENDATIONS IN ACCORDANCE WITH THE MANUFACTURERS SPECIFICATIONS. (1) Do not apply this product over any existing chlorinated rubber or acrylic coating. These must be removed completely by abrasive blasting or high pressure water blasting. (2) Existing epoxy swimming pool paint or fibreglass pool surfaces, should be sanded with 40 grit sand paper to ensure a good key to the surface. (3) Ensure concrete, textured plaster or fibreglass surface are completely dry prior to application. (4) Ensure rain is not imminent on the day of application. High moisture levels will flatten the finish of the cured coating. If applying second coat, make sure that there is no dew or moisture on the coating, as the second coat will not adhere. (5) When mixing, make sure that all the solids are dispersed off the bottom of both the base and activator, prior to combining the mixed portions. (6) Do not thin the mixed material anymore than 5%, and only use Rust-oleum 165 thinners which is specifically for this coating. (7) The mix ratio is 1:1 base/activator, no exceptions and once mixed together thoroughly, allow the mix to stand for 30 minutes induction period before applying by spray or roller. (8) The total dry film build must be between 350-400 microns. If roll applying, you may need to look at a third coat. Spray application, can achieve the 200 microns DFT per coat easily, and 400 microns DFT in two coats. (9) When the coating has been applied, remove any masking tape within 24 hours. Failure to do this results in the coating hardening to such an extent, the tape becomes difficult to remove. (10) The pool must stand empty for a minimum of 5 day, before filling and chemicals being applied. (11) Observe maximum immersed temperature of 520 C, and the pH of the water is to be between 3-13. Rust-oleum 9100 has an excellent historic performance here in NZ, providing it is applied correctly. 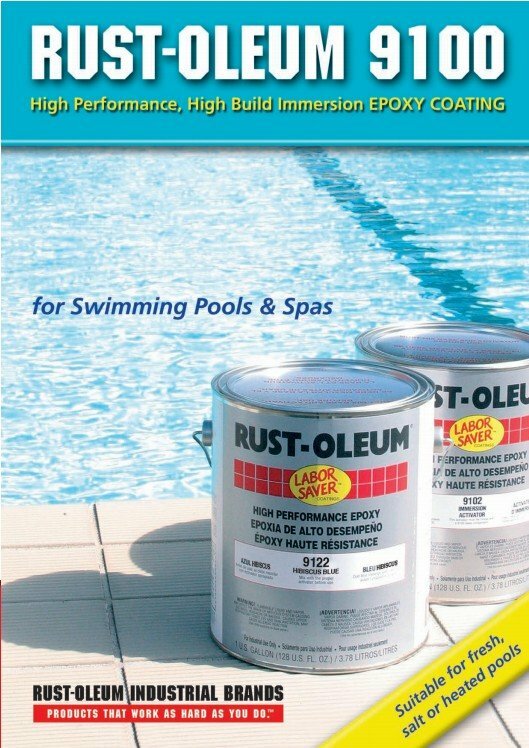 MODERN MAINTENANCE PRODUCTS NZ LTD.
RUST-OLEUM 9100 a High performance, high build immersion, epoxy coating suitable for fresh and saltwater pools. Handles hot or cold water with a pH 3-13. Variation of base colours can be achieved by custom tinting. Colours are for illustration purposes only. Materials can be purchased direct, or we can request one of our approved Applicators to prepare and coat your swimming pool or spa. A conditional product performance guarantee, can be issued with prior Company approval.